Look, when you’re wrong, you gotta wear the hat, so fit me with a big Star Trek sombrero. Four years ago, I thought rebooting the franchise with an origin story was a silly idea. Silly me. In the hands of director/producer J.J Abrams, it has taken on a new relevance, and the second effort from Abrams, Into Darkness, is a spectacular success on all fronts. From the opening sequence, Abrams settles into a breakneck pace, filling the screen with a rousing combination of action, effects, heart and humor that rarely lets up. The ace up Abrams’s sleeve? His cast. These are characters ingrained into pop culture, and our emotional investment in them is rewarded. 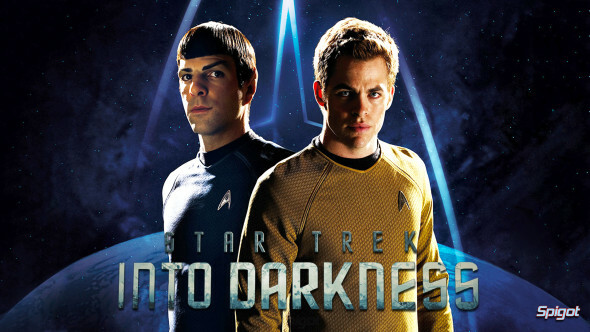 Chris Pine, Zachary Quinto and Karl Urban play Kirk, Spock and Bones with the mischievous twinkle of youth. Without resorting to caricature, all three actors are utterly believable as younger versions of these rogues we know so well. They are surrounded by an able supporting cast, most notably Benedict Cumberbatch as Harrison, the deadly villain with mysterious motives and a great big Enterprise surprise. Star Trek screenwriters Roberto Orci and Alex Kurtzman return, joining with Damon Lindelof to script a thrilling adventure filled with multiple callbacks to previous film installments and TV episodes. Quite simply, there isn’t much to dislike. Into Darkness is a finely crafted spectacle, all that a summer blockbuster should be. It is joyously nerdy, yet cool enough for those who wouldn’t know Nurse Chapel from Nurse Ratched. It’s funny, and true to its sci-fi roots while offering sly parallels with today’s political climate. Next up for Abrams is a new Star Wars sequel, and fans should rest easy. Into Darkness is more proof the man knows a thing or two about making a franchise live long and prosper. What I mean is, boldly go to the theatre.